If the term superfood inspires the image of a ripe fruit wearing a mini-cape, you clearly haven’t watched an episode of Dr. Oz or walked into a health food store lately. 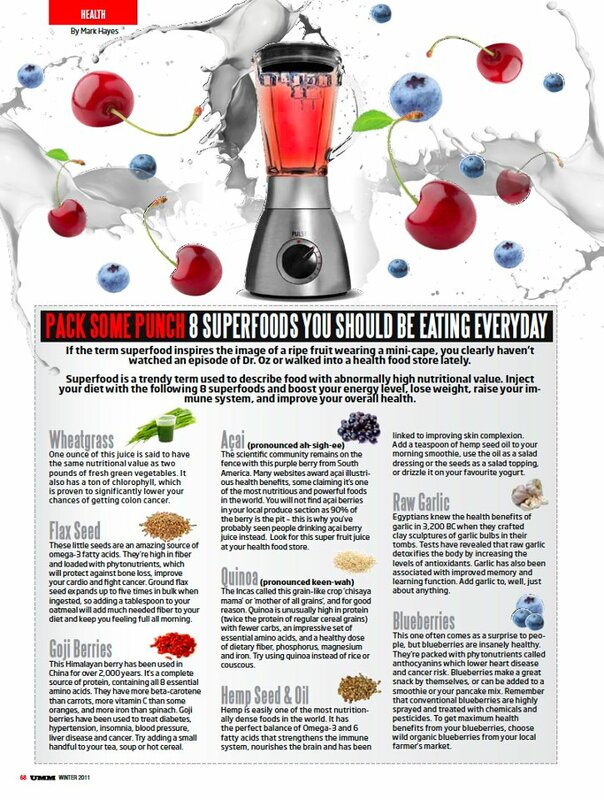 Superfood is a trendy term used to describe food with abnormally high nutritional value. Inject your diet with the following 8 superfoods and boost your energy level, lose weight, raise your immune system, and improve your overall health. One ounce of this juice is said to have the same nutritional value as 2 pounds of fresh green vegetables. It also has a ton of chlorophyll, which is proven to significantly lower your chances of getting colon cancer. You can grow and juice the stuff at home but you’re better off downing the shots at a juice bar. These little seeds are an amazing source of omega-3 fatty acids. They’re loaded with phytonutrients, which will protect against bone loss, improve your cardio and fight cancer. Flax seeds expand up to five times in bulk when ingested, so adding a few to your oatmeal will keep you feeling full all morning. This Himalayan berry has been used in China for over 2,000 years. It’s a complete source of protein, containing all 8 essential amino acids. They have more beta-carotene than carrots, more vitamin c than some oranges, and more iron than spinach. Goji berries have been used to treat diabetes, hypertension, insomnia, blood pressure, liver disease and cancer. Try adding a small handful in your tea, soup or hot cereal. The scientific community remains on the fence with this purple berry from South America. Many websites award açaí with illustrious health benefits, some claiming it’s one of the most nutritious and powerful foods in the world. While the verdict is being written, you can pick up açaí flavoured juice at most local convenience stores. The Incas called this grain-like crop “chisaya mama” or “mother of all grains,” and for good reason. Quinoa is unusually high in protein (twice the protein of regular cereal grains) with fewer carbs, an impressive set of essential amino acids, and a healthy dose of dietary fiber, phosphorus, magnesium and iron. Try using quinoa instead of rice or couscous. Hemp is easily one of the most nutritionally dense foods in the world. It has the perfect balance of Omega-3 and 6 fatty acids that strengthens the immune system, nourishes the brain and has been linked to improving skin complexion. Lightly cook hemp seeds to add to a salad and drizzle hemp seed oil on yogurt. Egyptians knew the health benefits of garlic in 3,200 B.C. when they crafted clay sculptures of garlic bulbs in their tombs. Tests have revealed that raw garlic detoxifies the body by increasing the levels of antioxidants. Garlic has also been associated with improved memory and learning function. Add garlic to, well, just about anything. This one often comes as a surprise to people, but blueberries are insanely healthy. They’re packed with phytonutrients called anthocyanins which lower heart disease and cancer risk. Blueberries make a great snack by themselves, or try adding them to a smoothie or your pancake mix.